Living and working in Beijing really opened my eyes. The people are extremely nice and helpful. During work, even though there is a huge language barrier, my colleagues do try to communicate with me and the manager was able to organise me to learn from different departments. I was able to make new friends and visit many places in Beijing. Everyone from GAC are very helpful and supportive. Overall I am satisfied with the program. 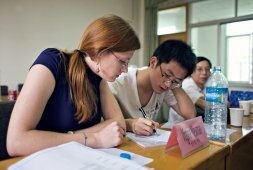 My Chinese classes were great and having one-to-one lessons was very helpful. The thing that really made my experience in China great was the location of my accomodation. I was situated in Chaoyang Park, a 10 minute drive from Sanlitun and easy access to the best areas of town. My apartment was clean and perfectly adeqaute. Thanks to the help of the expat friends I made over my time in Beijing, I was able to enjoy life in China to the fullest, and got to experience what real expatriate life is like. I even went on a weekend trip to Shanghai with a friend. Overall, my experience has made me want to come back to China, as life here is very easy and fun. Thanks again to all the GAC team. My overall trip: very good, I came to Shanghai. I learned a lot and meet amazing people. I feel more confident in myself and my career. My company: It’s a good company, and it is as work beneficial as I’d hoped. Many tasks were much related to marketing, and that’s what I expected. The people were all very nice. I still learned a lot about Asian work ethic. GAC: I think this is a good program. I’m glad I worked with GAC and very happy to get to know Jane! I think GAC puts a lot of effort into working with interns. They help us to inprove our Chinese langauge skills with providing us amazing Mandarin courses during our program duration in the city. I reall appreciate what effort they had done for me. It will definitely well effect my life in the future. If you are not a big city person and dislike the big crowds such as in Beijing, I would definitely recommend Qingdao. Qingdao is clean, the weather is moderate, has beaches, beautiful scenery, and the local people are quite nice. The only downside is that there is less culture and things to do than the big cities. You will have to find ways to keep yourself entertained. It is also hard to find other foreigners. I chose the shared apartment, but my roommate left after one month. I would recommend either – you get to meet someone new or grow independent. My Chinese definitely improved and I became more independent as a result of living by myself in a foreign country. I would recommend the language program as well. GAC has some famous University Chinese programs in deferent cities. GAC was satisfactory. I was able to quickly come to China and experience a different culture and learn a lot. The staffs in Beijing were pleasant enough during the application process and were quick to reply. The GAC representative in Qingdao city was welcoming, friendly, and tried her best to help with all my problems. She definitely made a big difference and enriched my stay in Qingdao. On Sundays, she would take me to see a lot of what Qingdao had to offer. The Chinese school was at an appropriate pace and the content of what we learnt could be applied to daily situations which was effective for practising Mandarin. 4 weeks from learning Chinese intensive classes is supper effective and useful for me. I think I will attend GAC's one semester or year University Chinese program in BLCU in 2018. The accommodation and family were lovely, very accommodating and helped out a lot when I had a problem. And it is also a convenient location. Generally, my program and life in Shanghai are excellent. Overall I enjoyed my experience with GAC. I was pleased with the amount of knowledge I learned and the new experiences I went through during my internship as a financial analyst at a finance company which GAC found on my behalf. The internship made me realize how fast things move in the finance industry and I feel it has prepared me well for the transition from university to the work force. The diversity of the work I completed made me realize my capabilities and had me further develop my skillet, and consolidated my interest in the industry. The networking opportunities to work alongside partners and analysts from different backgrounds will no doubt accelerate my career. In the future I would like to undertake another internship before I officially commence my professional career. GAC also organised activities throughout my time in China, and provided valuable assistance when required. I first came to China for the language specifically and got the chance to go to Peking Univesity Chinese program and study for half a year. I am now currently interning at Vericant, in Beijing China, an IT company focused on carrying out video assessments for chinese students applying to study abroad. Applying through GAC was the best decision I made while searching for an internship in China. They arranged everything, from finding my perfect internship company to providing a great accomodation for me and much more. They have really been supportive and have always been available to assist me whenever i encountered any difficulties. After staying in Beijing for 4 weeks, I have come to love the culture, the people and food. Beijing is so rich in history and adventure. Before I end my internship in December, I hope to explore more of China and be more amazed by this beautiful country. In conclusion, I have had the best experience so far in China and would definitely love to return sometime in the future. I will be going back to the UK once my internship is done to continue with my university course. For now though, there is still much more to learn about Beijing especially on the weekends since I'm off work. I still practise my Chinese everyday, and I have really come to enjoy my time here the more I get used to it. I did my internship at a Public Relations company called Storymaker in Beijing. I chose GAC because when I was searching for international internships, they are the company I first came across and it said they were the best at arranging such internships. The team was really helpful up until I got to China, the activities were also great as it was a chance to meet other people, and catch up with the ones I already met before. During my time in Beijing, I was renting a small apartment, and I was happy to meet my neighbours and make more friends, plus it was really close to the city centre and subway line. Beijing never sleeps! there is always a new place to go to or something to do. But I wasn't so impressed with the fashion as I thought it would be great. But at least I got to learn some "Beijing Hua"! Another thing I also enjoyed was the food - my favourite was "jianbing", its a type of pancake but fried and with lots of vegetables and sometimes meat or egg. I got to see the Ming Tombs, learnt how to use wechat and enjoyed the online shopping. I did that whenever I needed retail therapy. Overall I had the best time in Beijing! Thank you. I am currently in the middle of my internship in hospitality, I am located in the city of Wuxi in Southeastern China. I am working at the Millennium Hotel, which is a 5 Star falling under Millennium and Copthorne Hotels with many branches all over Europe and northern America. I am a Guest Relations officer here and a lot of my daily tasks are about attending to guest requirements, concerns and work with the front dest too. I love it here, and I am learning so much. I speak English, Spanish and some German so all these languages come in handy when I communicate with foreign guests. Because its close to Shanghai, I've actually taken the train to see Shanghai, which was very beautiful too. Wuxi is charming and has many small hotspots I often like to visit. My program was one month long; I took the small group Mandarin Program in Beijing. I would say definitely that my confidence when speaking Chinese has increased even after spending just a few weeks studying in Beijing. I had already learned some Chinese before for 3 years back in high school, so this was just a continuation and a chance for me to visit Beijing. Of course the first two days were difficult in class and just a big mess, but I made friends quickly, my classmates were also cool. The teachers were nice and always taught in Chinese, I was okay with this and was even able to understand Chinese jokes in class. I lived with a Chinese family in their home. Chinese homes are a little smaller that what I am used to in the States but it was fun snacking on lychee fruit around the house, then being called downstairs for dinner and having people to talk to in the evening and practise my spoken Chinese. I decided to go with Go Abroad China after spending many many hours researching for a program that was affordable and would fit my time limit. They gave me a really good service, we went our for hotpot, went to climb the Great Wall and hung out during the weekend. Beijing was really great, it is such an odd mixture of old and new, and has a great diversity of foreigners from many different countries. Go aboard China was the one of the best things to happen to me!!! I did the homestay program where I stayed with the cutest family they were so kind to me!!! Kinder then the family I have now lol I actually miss them and think of them often even though it's been a few months since I left the program. 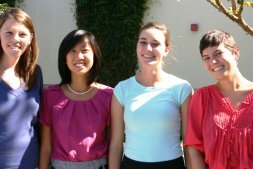 I also got to work in an amazing engineering firm Wison were I had the most loving and hilarious coworkers, I literally just fit right in ! GAC I would recommend to a friend or any one reading this. Even when i wasn't in the city of Shanghai , GAC still helped me, plan , get and make sure I was safe during my trip to Beijing. I love GAC!!! I had a wonderful experience in Beijing, China. Coming from Australia I did not know the Chinese language or culture at all, however, the staff at Go Abroad China were super helpful from Day 1 and helped me to make the transitions easier. The internship company was more than I wished for-- great work environment, friendly atmosphere and a supporting network of staff and colleagues. This was an amazing experience for me and would recommend interning abroad with Go Abroad China. Living in one of the most crowded city in the world and being able to go to work in a little tuk-tuk every morning is just a normal thing in Beijing. Everything is so different from Portugal and that's why I think I really enjoyed my 6 months in China. I have experienced so many things that I will never forget! I met people from all around the world and traveled with them in different cities during the weekends. I am really thankful for that professional and personal opportunity: thank you GAC! I did the internship program with GAC for 3 months. I used to work in a consulting company that was in charge of helping foreign businesses that wanted to develop their market in China. My colleagues were from China, United States and France. Working in a multicultural environment has taught me so much! As a member of the business development team, I had the opportunity to organize various business meetings, build out a strong professional network, develop my oral presentation skills, etc. I will be forever grateful for that professional experience. My 3 months in Beijing were crazy fun! In this city, you honestly just don't have the time to get bored. There are so many things to see, eat and do! Moreover, the expat community in China is very big and the fact that GAC was organizing activities during the weekend helped me meeting amazing people that also have the same interests as me: traveling! If I had another 3 months of vacations, I would definitely come back to Beijing for a similar experience with GAC! Shanghai is the city to be: shopping, great restaurants, nightclubs, a lot of foreigners... Seriously how can you hate Shanghai? I personally think it's impossible! I had the time of my life in Shanghai and met so many people. I am pretty sure I'll go back in few years. I did a three-month internship in a 5 star hotel. I learned a lot of things with this internship so I am pretty satisfied! I worked in the HR department. At the beginning of the internship, I was assigned a buddy to guide me through the whole training program. The fact that they assigned me someone made me feel really comfortable and helped me know people faster. I can't complain about my internship and the people I was working with, they were simply amazing! During my internship life in the hotel, GAC offered me some useful conversational Chinese courses to help me to improve Mandarin language, so that I could simply chat with my Chinese coworkers and customers. I had a great experience with GAC and BLCU short term Chinese program in Summer. Before coming to China I couldn't speak Mandarin at all and had in mind that it was the most difficult language ever. Now, I can have small daily conversations with Chinese people and I am so proud of myself! University Chinese program is very effective for you to learn Mandarin. The teaching system is great. Expecially BLCU Chinese program. Those 2 months in Beijing were very interesting because I got to live with a Chinese family and experienced the real Chinese life! The family that I was living with was very comprehensive and would let me go out with my friends without any problem. The father and also the kid could speak good English. The whole family was adorable. They once invited me for a weekend to Xi'an. I really felt like I was part of the family and that is why I will certainly keep in touch with them! I enjoyed my student life in BLCU so much. I love China, I love my host family, I love my Chinese school, and I love Go Abroad China. Thank you, guys! For the internship program, I decided to live with a Chinese family. The apartment was located in a wealthy neighborhood and close to a subway station, which was very convenient for me. The family members were really friendly and always willing to help me whenever I needed it. As for the internship, I was surprised to see the amount of responsibilities I had. It was actually good for me because I got the opportunity to further stretch my skills. My coworkers were helpful and gave me the necessary support to accomplish all of my tasks. They even helped me with the Chinese visa application form for me to extend my stay in China. I learnt Chinese with a Chinese teacher who is from Peking University. She is professional and patient. I am very appreciated for this experience in China with GO ABROAD CHINA. I came to China for the Internship Program and spent 2 months in the capital. I decided last minute to come to China. I was supposed to travel for 2 months in Asia but my traveling partner could not come anymore and I did not want to be alone traveling. So I decided to enroll myself in the GAC internship program because I knew I was going to meet people there. Even though I was working full time, I had the time to enjoy life in Beijing. I participated in all the activities organized by GAC. We went to the Great Wall of China, Forbidden City, Temple of Heaven, we made some dumplings and had a crazy night drinking baijiu with some Chinese friends. They taught me much Chinese sentence. GAC gave interns some Mandarin classes every week after working time, which is very helpful. After I learn it, I immediately practice with my lovely Chinese friends. I also met a bunch of people that were doing the same program as me and we ended up hanging out all together almost everyday after work in Sanlitun; a popular foreigners' area. Overall experience: pretty great experience filled with loads of adventures, I would come back tomorrow if I could! I worked as a project design consultant for a start-up company in Beijing. My colleagues were all very friendly with me and helped me a lot in adapting to the business culture. The people that I worked with were very patient and took the time to explain me how to avoid any cultural misunderstandings that could scuttle any of the company's deals. It really seemed that they were used to have foreign interns! Studying Chinese is very useful and a smart decision. The fact that I have a better understanding of Chinese business culture and language is a huge advantage for me since China is gaining ground in business influence. I honestly think that this international experience will be useful for future job opportunities! I would definitely recommend ‘Go abroad China’ without a once of hesitation, they give you just the correct balance between freedom and their fun organized events. You can always get in touch with any of them if you need help which is very reassuring. The coordinators are fantastic people that I had the chance to meet around good Chinese dinners and weekend activities. By the way, just a little advice for vegetarians: in China the menus are in Chinese so tell the ‘fuwuyuan’ (the waitress) ‘wo chi su’, which means that you are a vegetarian.Learning Chinese in Beijing with local people is very interesting. The beijingers have some special accent regarding some specail Chinese words. in additional, the staff will be able to help you choose your food. By joining the internship program, I have to say that I've also learned a lot about other nationalities. I met other GAC participants that were from different countries. I've learned so much about their respective culture. I now have a better understanding of Moroccan and Tunisian people because of two other GAC participants that became my good friends. Actually, I am planning to go to Casablanca in 3 months to visit Sarah, my friend that did the internship at the same time as me. Making friends is one of the main highlight of this company. Participants are so different (because we come from different countries) but in a way so similar it is difficult to explain... I don't know if it's the fact that we are all experiencing the same things at the same time or what, but I really feel like building strong friendships was way faster and easier than in my own country where we have the same mothertongue. I guess you have to live it to totally understand what I mean! The first day that I arrived in Chengdu, I felt intimidated. Chinese people were looking at me like if I was an alien or a famous actor. It was actually a bit weird and overwhelming at the same time. A lot of people would stop me in the streets and ask me if they could take a selfie with me. I did not really understand why they wanted to have a picture with me so bad. In France that kind of situation would only happen if you are a superstar! The internship gave me some great experience of working in a school. My colleagues were very supportive. They helped me a lot since my Chinese was not very good. I really appreciated the fact that they gave me a lot of responsibilities. I experienced what it is to be a real teacher since most of the time I had my own class and was free to teach with the methods that I was comfortable with. GAC has their private tutor school in Chengdu, my Chinese teacher is very nice and caring and professional in teaching. I still need to more about Mandarin. The language is mysterious. I suggest GAC. It's a great program. I had a fairly positive experience with GAC. I lived with a young Chinese professional (no English) and studied 6 hours a day with a tutor provided by GAC. I would recommend it if you really plan to improve your Mandarin level. Accommodation was great. I had everything that I needed. I had a small living room, 2 bedrooms, 1 bathroom and 1 kitchen. Neighborhood was definitely safe and generally speaking I have to say that China is very safe. GAC coordinators were very helpful and attentive. Do not hesitate to ask them to accommodate or help you. As for my Chinese lessons, in the beginning I learned mostly the basics, like how to order food in Chinese, transportation, greetings etc. But as I moved to the intensive Mandarin lessons, it definitely got much trickier and just the amount of stuff I had to learn increased. Learning Chinese is a very interesting thing, since you gonna meet a lots classes from all over the world. 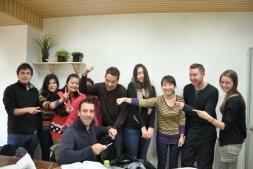 We are having fun during studying Mandarin in a small group class together, we all learnt a lot from our Chinese teacher. I really enjoyed studying Chinese though! 20 people coming from different countries, learning Mandarin together in a small group class from Monday to Friday: that’s the spirit! The two months in Jiaotong University were just crazy! I was not expecting that at all. I had so much fun learning and living the life in Shanghai that I did not want to leave. People were great and teachers also. I have learned how to write 200 Chinese characters in 2 months. When I arrived in Shanghai, I could only say ni hao… Now though, I can impress a lot of Chinese girls with my language skills! GAC is very professional in providing Chinese courses for adults. Chinese language is amazing! Trust me! You deserve to come and learn... China is beautiful, and it's culture is a super historical country. A number of things contributed to making my internship such a fantastic experience. First of all, as I chose the home stay option, I was living with a Chinese family in a typical Beijing apartment. The family was very kind and provided assistance to me where they could. Secondly, the internship position itself and the company I worked for were excellent. For the first time since starting my studies I was able to get real-world, hands-on experience applying my knowledge, and I got to learn a lot of new stuff along the way. Thirdly, the other employees at my work were great people who really enriched my experience. Initially, I discovered GAC simply because they were one of the few overseas agencies to offer an internship program in my discipline. After browsing their website for an hour or so it became apparent to me that GAC was an extremely professional organization that has a clear understanding of student needs. Then proceeded to contact a representative of the company. All of my questions were promptly answered, and the process for applying for the internship program was clearly explained. Prior to coming to China I did not speak any Chinese at all, and naturally this makes life a little bit difficult, especially when trying to get directions or ordering food at restaurants. However, the program coordinator’s service was extremely good. They were extremely friendly and helpful, and made the transition to Beijing life much easier than it would otherwise have been. The program also provides me some Chinese classes, GAC has teir own Mandarin school in Beijing and shanghai. I learnt a lot about Chinese language. After a few months of learning Mandarin in small group class with GAC , and my Chinese indeed improved a lot. I will recommend this program as it provides a very unique and rewarding experience, and is provided by a very professional and helpful organization. Choosing GAC for my internship has been an excellent decision, and I have not regretted it for a moment. I came to Beijing for 3 a month Internship, because I wanted to improve my career prospects and study Chinese. I have to say that I am very satisfied with my experience and also GAC's assistance. Even though I came in China alone, I knew that there was an organization that could help me with everything: visa, accommodation and also the culture. Now that I've accomplished an internship in China, I feel way more confident about what I can achieve! Before coming to China, I was afraid of working in a different environment and now I find it pretty exciting! You get to meet people with a different background and you learn so much about yourself! You are constantly challenged by the culture and I think that's what makes your experience so memorable. In addition, I did take some Chinese lessons, and because I was a beginner, I did have to learn Chinese from English. Learning Mandarin Chinese ( small group class) can be difficult at times if I'm being honest but at least it will help you with basic things if you are going to be in China for some months. Please click GOABROADCHINA YOUTUBE to see more video testimonials from our past program participants.